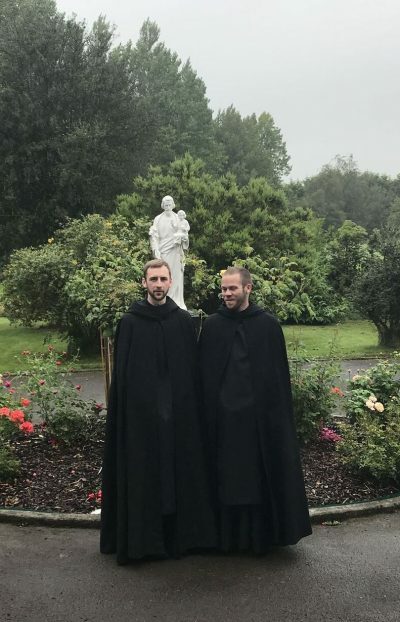 On Wednesday, 22 August 2018, Octave of the Assumption and Feast of the Immaculate Heart of Mary, Mr Desmond McKee of County Tyrone, Northern Ireland, and The Rev’d Ryan Sliwa of Springfield, Massachusetts, received the holy habit of Saint Benedict and entered upon their noviceship. 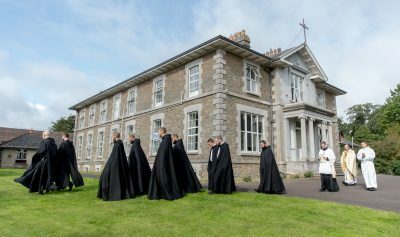 Mr McKee was given the name Brother Placid, in honour of the disciple of our father Saint Benedict, and Father Sliwa was given the name Brother Gregory, in honour of Pope Saint Gregory the Great. 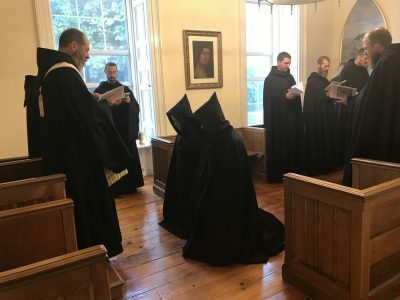 My dear sons, Desmond and Father Ryan, your reception of the holy habit of Saint Benedict comes on the Octave Day of he Assumption of the Blessed Virgin Mary; it is the third and last of the three occasions of grace and thanksgiving that will have marked August 2018 in the history of our monastery. On August 6th, in the radiance of Our Lord’s transfigured face, shining more brightly than the sun, Dom Hildebrand pronounced his simple vows for three years. 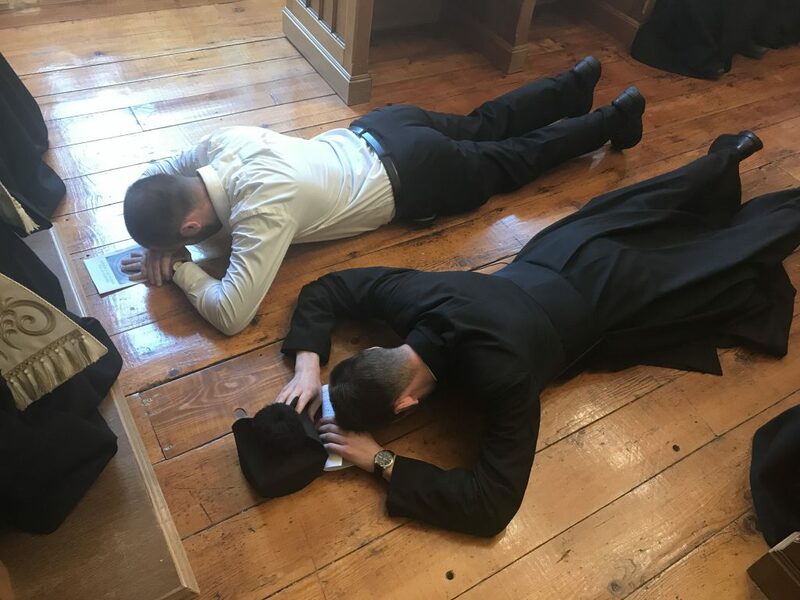 One week ago, on August 15th, in the jubilation of the Assumption of the Mother of God, Dom Finnian and Dom Elijah entered again into the death and resurrection of Christ through solemn profession and received the monastic consecration, setting them apart until death for The One Thing Necessary. Today, you, Desmond and you, Father Ryan, ask to be received among us into this “school of the Lord’s service” (Prologue). You have already begun to walk in “the hard and rugged paths by which we walk towards God” (Chapter 58). Over the past months, we have seen that you are truly seeking God. We have found you eager for the Work of God, prompt in obedience, and patient in humiliations. 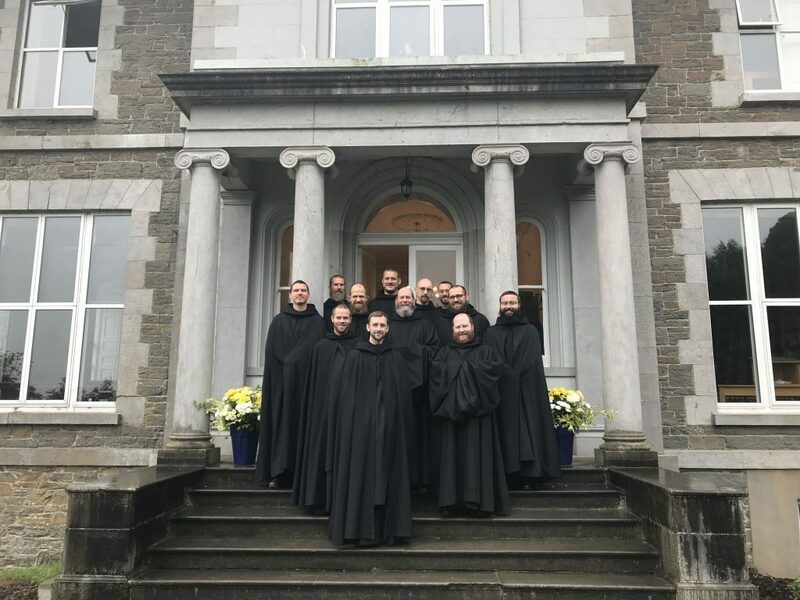 The monastic habit protects no man from the experience of weakness, desolation, fear, and humiliation. But, so often as you are brought low by these things, go humbly to the throne of grace, to the Mother of God, “to obtain mercy and find grace to help in time of need” (Hebrews 4:16). He who can find in his way to the Mother of God, even while “mourning and weeping in this vale of tears”, will never be without hope.